Personalised embroidered finest quality combed cotton bath towels a unique useful and luxurious gift in classic black and white. Personalised embroidered finest quality combed cotton bath towels a unique useful and luxurious gift in classic black and white. Treat a special person or a couple to a unique gift. Popular for wedding or anniversary gifts and even a great housewarming gift. Personalised embroidered finest quality combed cotton bath towels a unique useful and luxurious gift in classic black and white. Treat a special person or a couple to a unique gift. Popular for wedding or anniversary gifts and even a great housewarming gift. Available in hot fashion shades straight from the catwalk, why not update your bathroom! These large bath sized towels are 100 percent super soft and absorbant Egyptian cotton. 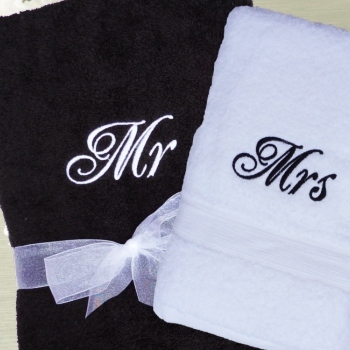 You can choose the option and have these towels made extra special - these can be personalised with your choice of text, including His and Hers, Just Married, Happy Anniversary, His Lordship, Her Ladyship, or the couples names embroidered or initials monogrammed on each in coordinating thread. Comes with 1 black and 1 bright white towel, a very soft and very unique gift set!